Following the directions of a local court, a DSP and four other cops have been booked for allegedly murdering a resident of Pundri village in the district. Having a dig at the alleged absence of senior Congress leaders from the Indri bypoll scene, the INLD leadership today claimed that Chief Minister Bhupinder Singh Hooda had failed to impress even his cabinet colleagues. There may be shortage of power and drinking water in villages but liquor is available in plenty as it is openly available in most of the villages of the district at illegal and unauthorised sale points in various villages. The police today arrested six persons in connection with a clash between two groups in which two persons were killed and as many were were injured yesterday. Manmohan Singh of Panipat shot at Amit Sidhu of Hisar to square a dispute with the latter at Housing Board Colony here today. The police today arrested four persons for reportedly thrashing a bus conductor. Members of the local depot of the Haryana Roadways union had blocked road in protest of the incident. Residents received the jagriti yatra of Guru Granth Sahib (Gurta Gaddi) with religious fervour here today. Campaigning in the Adampur assembly constituency has intensified. Today all three bigwigs of Haryana politics - Chief Minister Bhupinder Singh Hooda, Om Prakash Chautala and Bhajan Lal - toured various villages even as the area reeled under a severe heat wave. To check unauthorised domestic LPG connections to regulate the supply, oil major Hindustan Petroleum has cancelled 250 gas connections besides suspending supply of another 5,000 consumers. With the ground water in the city already declared unfit for human consumption due to presence of high mercury content, Panipat is all set to get an alternate water source. A Hisar-based non-government organisation, Lok Pratham, today moved the high court for directions to the state of Haryana for the release of grant-in-aid to gaushalas for saving cows, at the brink of starvation. The Haryana Board of School Education has relaxed the condition of getting 40 per cent marks or C+ grade in the secondary examination for students who were admitted provisionally to class XI. The Haryana government today ordered the transfer of three HCS officers with immediate effect. ADJ M.C. Mehra today sentenced seven persons to life imprisonment in a murder case. The body of Satte was recovered from a canal near Kaimalgarh village on April 17, 2005. The district police is struggling hard to restore its lost image, as it has been unable to crack some criminal cases that took place in the district in the recent past. The police has booked Lalita Sharma’s husband Tulsi Ram Sharma, mother-in-law Ganga Devi and brother-in-law Ved Prakash Sharma, all residents of Dhani Badh village, 25 km from here, for the dowry death of Lalita, who died of severe burns at Safdarjung Hospital, Delhi on May 1. Kar sewa launched by the Kurukshetra Development Board (KDB) at Brahmsarovar here on April 24, 2008, yesterday witnessed a thrilling moment as the religious organisations and devotees joined the kar sewa. The Tribune had first reported the incident on May 11, 2007. Subhash’s body was found near the railway track in the district a day after he was allegedly detained in the Gharaunda police station. The family had disputed the official claim that Subhash was a “railway accident” victim. He, along with four other persons of the village, was summoned to the Gharaunda police station on April 23, 2007, in connection with the alleged murder of an old man of Pundri village, about 35 km from here. It was alleged that police officials had used third- degree means during interrogation. Apprehending foul play, his family had alleged that the authorities concerned, including the state police and GRP officials, had refused to lodge an FIR in the “murder” case. The family approached the Punjab and Haryana High Court after which the case was referred to Karnal district. SP (GRP) Bharti Arora confirmed that a case had been registered against the then Assandh DSP Pradeep Singh Sheokand and four other policemen. At present, he is posted as DSP, Panipat. No arrest has been made in the case. The victim’s body was found on a railway track near the GT Road on April 24, 2007, and even though the post-mortem report termed the death as a “railway accident”, the family has rubbished the version. The post-mortem examination was conducted at the Panipat civil hospital on the same day, sources said. 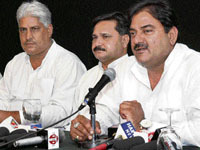 Addressing mediapersons here today, president of the Haryana Olympic Association and INLD leader Abhay Singh Chautala alleged that voters of Indri were annoyed with the Congress government over its failure to carry out development activities during its three-year tenure. it. Chautala alleged that fearing “voters’ outrage”, Hooda was “cautioning” the Indri voters that if they did not elect the Congress candidate, they would be deprived of several benefits, including jobs and developmental activities. He said the party had written to the Election Commission against the “gross misuse of the official machinery” by the Congress to pressure panches and sarpanches to case vote in its favour. “Non-development is a major issue here and the embarrassed Congress leadership has completely avoided canvassing in Indri,” he added. Terming the Haryana Janhit Congress (BL) as a party of opportunists, he stated both Bhajan Lal and his son wanted to become the Chief Minister. Commenting on the recent firing incident at Panchkula involving a gunman of Deputy Chief Minister Chander Mohan, Chautala said it was a shameful incident. In a bid to shield themselves, INLD members had been falsely implicated in the case, he added. All this has brought cheer to merrymakers but has become a source of big nuisance for women and girls of villages. Villagers frequently visit the local mini-secretariat to plead with the district authorities to solve this problem. They complained that men under the influence of liquor create scenes and it had become unsafe for women to move freely on village streets. The opening of unauthorised and illegal sale points of liquor in various parts of the district has reached alarming proportions and if the authorities do not act swiftly to curtail this illegal trade it may soon become a social and law and order problem. Parliamentary secretary Dillu Ram, who represents Guhla (reserve) assembly constituency of the district, has asked deputy commissioner Vikas Gupta and SSP Anil Kumar Rao to take effective steps to check this illegal trade of liquor. This problem has not only disturbed the peace of homes of the women folk of the district but has also become a challenge to their personal safety, honour and dignity. Finding the authorities lax in coming to their rescue, they have now started raising their voice. Last month, villagers, including women and children, had blocked traffic on the Kaithal-Kurukshetra road for four days consecutively demanding closure of illegal liquor shops in the villages. The number of these illegal liquor shops has been increasing gradually and women and children have become victims of this illegal trade as they have to bear the burnt of drunkard men. They complained that other than the authorised liquor vends, liquor was freely available at tea shops and even at general stores. The main grudge of the women folk is that due to easy availability of liquor more and more people have started drinking and most of them belong to the poor strata of society. The deputy commissioner and SSP said the excise department had been dealing with this problem and the villagers had been provided with separate police force. They would soon chalk out a strategy to tackle this problem effectively, they added. SP Anil Kumar Rao told mediapersons here that those arrested were Surinder, Pradeep, Jaiveer, Om Prakash, Hoshiar Singh and Pradeep. He said a hunt was on to nab some more suspects in the case. Raids were being conducted in this connection, he added. Meanwhile, the two injured persons who were referred to the PGI, Chandigarh, are out of danger, according to Rao. The incident sent shock waves in the area. Both boys are students of Polytechnic College of Jan Nayak Chowdhary Devi Lal Vidyapeeth. Amit was hit in the abdomen and was rushed to the Civil Hospital where his condition is said to be out of danger. However, the accused ran away after committing the crime. A case has been registered. SP Vikas Arora said the police has conducted raids at the possible hideouts. According to some of their classmates, Amit and Manmohan had an altercation over surfing of channels some days ago. However, the police has declined to buy any theory till the inquiry was completed. Kuldeep Singh Dhindsa, director of the college, said both were not living in the college premises and even fought outside the college campus. Hence, the college authorities did not have any control and knowledge of the matter, he added. Irked at the slow pace of inquiry, some members of the union parked buses on NH-10 today that led to chaos. Following assurances by the police for taking action against the accused, the protesters agreed to lift the blockade. Gurbaksh Singh Randhawa, leader of the union, said over a week had past since the incident but no arrest was made till date. But later, SP Vikas Arora said three accused were arrested last night while another was apprehended today. The accused were identified as Ajay from Jind, Naveen from Panipat, Monu and Pradeep from Hisar. Bikram Singh, a conductor with the Haryana Roadways, said some students of Polytechnic College, Nathusri Chokta, assaulted him on May 5 after he asked them for tickets. On his complaint, a case for obstructing government duty and physical intimidation was registered. The yatra went through various areas of the city. Earlier, the religious procession comprising a decked-up vehicle carrying handwritten Guru Granth Sahib and another vehicle carrying 16 weapons of Guru Gobind Singh reached Gurdwara Dasam Patshahi. Devotees started reaching the gurdwara since early morning. Subsequently, a religious procession was taken out. Arrangements had been made for potable water and langar (community kitchen) all along the way. The yatra, which started from Nanded (Maharashtra) crossed over to Dabwali (Sirsa) from Ganganagar last evening. For Hooda this was his third tour since the campaigning began. His son-in-law Kunal Bhadu has been camping here since the campaign began. Hooda’s son Deepender Hooda, MP, has also toured various villages of the constituency twice. INLD supremo Om Prakash Chautala has also devoted much time to this prestigious constituency. His son Ajay Chautala, MP, too, has intensively toured the constituency for days together. Bhajan Lal, who is contesting the byelection, and his son Kuldeep Bishnoi are campaigning relentlessly. In between they have found time to campaign for their party nominees in Gohana and Indri also. All candidates have different styles of campaigning. INLD’s Sampat Singh has a more informal style. His election meetings are mostly interactive where he chats with gathered villagers explaining his point of view. However, when Chautala comes calling, formal speeches are given, but not at the cost of personal interaction which follows after the speech. Similarly, Bhajan Lal and Kuldeep Bishnoi have a mix of personal interaction and speech-making. But it is Bishnoi who dominates the scene. His father Bhajan Lal only speaks at the end. Yet both are able to communicate with their supporters on a personal level. Bishnoi’s emphasis is on the ties between the Bishnoi clan and Adampur voters which he describes as a "family". The Congress campaign is more formal in nature. The leaders accompanied by the party nominee Ranjit Singh arrive at a meeting in a motorcade. There is lots of garlanding and then speeches follow. It is the same when Hooda comes calling. The campaigning has brought in hundreds of outsiders to campaign in the area which is not surprising considering three of the main contenders are outsiders. Ranjit Singh has brought in supporters from the Rori constituency in Sirsa as well as from Gurgaon district. For Sampat Singh his longtime supporters from neighbouring Bhattu Kalan are also there. All candidates have hired professional help for publicity. Scores of press notes are circulated daily, both in hard copy and digital forms. Photojournalists have been brought in to take care of the visual aspect of the campaign. All this for an issueless byelection. With just four more days to go before the poll din ends, the candidates do not want to leave anything to chance. By now the voters have made up their minds. But last-ditch attempts to influence them through relatives and friends will now start. This is a crucial exercise towards the end of the campaigning. Meanwhile, the administration has geared up for the polling on May 22. In the beginning there were anxious moments for the administration because it was known that the election would be fought fiercely. So far it has been completely peaceful. The action was taken after identification of consumers who have more than one connection. As per LPG control order, a single family is authorised to have only one gas connection. For the second one, approval of the competent official of concerned oil company is necessary. Indicating large-scale violation of the rule, sources in oil companies said more than 30,000 such unauthorised connections had been identified in the city. In all, there are 3 lakh consumers here. The drive to identify such connections has been on for the last 3-4 months. “The supply situation is likely to improve further after action against unscrupulous consumers is taken. Moreover, it is a subsidised item, so checking its large-scale misuse becomes all the more necessary,” said district food and civil supplies controller P.K. Sharma. About 7-8 years ago oil companies liberalised the release of gas connections. Misusing this, a large number of consumers availed more than one connection, which became a major factor in creating imbalance in the supply of cylinders. The state government has sanctioned Rs 205 crore for setting up of a canal water supply system here, which would make water available for drinking and irrigation. Under the project, water would be lifted from the Western Yamuna Canal (WYC) which passes through Panipat and after treating it at a treatment plant, it would be used for drinking and irrigation purposes. According to deputy commissioner Mohinder Kumar, a site to set up the treatment plant had been identified and the process of acquiring land had been initiated. He informed that as per the project report an area of about 50 acres was required for setting up of the plant. The project is all set to be launched soon after the irrigation officials give their consent, he said. As per the test reports of various samples of groundwater collected from different parts of the city, it was found that there was high concentrations of pollutants that made it unfit for human consumption. Following this, a decision was taken to use canal water for drinking and irrigation. It became mandatory to set up a water treatment plant as the river passes by Yamuna Nagar and Karnal before reaching Panipat. All the domestic and industrial pollutants from both cities are drained in it. An augmentation canal that branches out of the WYC at Yamuna Nagar and rejoins the canal about 80 km downstream at Karnal is another major cause of pollution. The district officials are optimistic that once the treatment plant was commissioned, it would be safe to use water from the WYC for human consumption. They contended that water from the WYC is treated at Haiderpur treatment plant, which supplies water to Delhi and there has never been a problem. The petitioner said in an identical petition, the Delhi High Court had issued directions to the authorities concerned, including the Delhi Municipal Corporation, to release an interim aid of Rs 25 per cattle, per day, to all the gaushalas. The petitioner also attached photographs in their petition, highlighting the plight of the abandoned cows and the manner in which they are slaughtered. The High Court has stayed till further orders a notification whereby notice of motion was passed against Om Prakash Bansal, chairman of Bhuna Panchayat Samiti in Fatehabad district. A high court Division Bench of Justice K.S. Garewal and Justice Daya Chaudhary also issued notice of motion to the 21 members of the Samiti, along with the state. Bansal had earlier alleged gross irregularities in the voting on the no confidence resolution passed against him on March 20. The petitioner alleged that as per rules the voting on all such motions had to be confidential, but in the present case, the officials conducting the voting openly instructed the members where to stamp to support the resolution, thereby violating the secrecy. Photographs from a CD showing the alleged irregularities by the officers in violating the secrecy of voting, too, has been annexed with the writ petition. The condition of getting 40 per cent marks or C+ grade in mathematics and science subjects in the science stream and 40 per cent marks or C+ grade only in mathematics in the commerce stream has been put forth. The students whose results of class XI had been withheld or cancelled by the schools for not fulfilling the condition in the two consecutive chances will also be included in it. A spokesman of the board said here today that if such students had been declared successful in the secondary examination by the board and also fulfilled other conditions for admission, their results of class XI examination could be declared and they could also be admitted to class XII if they passed class XI examination. The cases of such students should be decided by the head of the institute and not forwarded to the board, he added. Vinay Singh, general manager, Haryana Tourism Corporation, has been posted as SDM, Tohsam, vice Sant Lal Pachar, who becomes the district development and panchayat officer (DDPO), Panchkula. Aurbind Sharma, DDPO, Panchkula, has been posted as SDM, Panchkula, relieving Maheshwar Sharma of this charge. The police had registered a case of murder against the accused on a complaint of Praveen, brother of the deceased. The local court had convicted Ajay, a resident of Mandothi village, Sukhvinder of Ritoli village, Krishan of Panchi Jatyan village, Vinod of Chhara village, Parneet of Baroda village, Chandrahas of Farmana village and Rajender of Jasia village of murder, who were sentenced to life today. The court also imposed a fine of Rs 6,000 on each of them. According to the police, the accused had called Satte from his house, shot him dead and dumped his body in the canal. In an apparent knee-jerk reaction, the government has decided to allocate two companies of police force on a permanent basis for Faridabad district against the backdrop of occurrences of serious crimes like murders and loots. The impunity with which the criminals have been executing their plans and the police inability to solve them has only added to the apprehensions of the general public. The twin murders of Ajay Sharma, nephew of former Congress MP and party stalwart Chiranji Lal Sharma, and his business manager followed by looting of over Rs 18 lakh have put the police force on the backfoot. The incident assumed poignancy, as Ajay Sharma was also a relative of the working president of the ruling Congress in Haryana, Kuldeep Sharma. Even after more than a week of the incident, the police has been unable to identify the criminals and their motive to kill Ajay Sharma. Rather, the police has courted controversy by stating that the motive of the criminals appeared to be looting the money. Family members of the deceased, however, are of the view that the way the attack was conducted, it indicated that murder was the primary motive of the criminals. It is on this account that muted voice for a CBI probe in the case is being raised. Just a week before the incident, two youths looted Rs 22 lakh from employees of a private firm at gunpoint. The police has not been able to solve that case till date. The police failure on investigation and follow-ups was also thoroughly exposed in the twin murder case, where two college-going sisters of Prithla village in Ballabgarh were brutally murdered. Even after more than a month, the local police has failed to solve the case. On account of public pressure in the face of police inability to crack the case, the state government referred the case to the CBI for investigation. Last Diwali, an engineering student was murdered in Ballabgarh area. The police continues to be in the dark in the case. On a complaint filed on May 14 by Subhash Sharma, father of the deceased and resident of Jhagroli village, the police has registered a case under Sections 498-A, 304-B, 406 and 34 of the IPC against the accused. Lalita, who got married to Tulsi Ram on November 23, 2005, gave birth to a son in 2007, following which her in-laws allegedly demanded Rs 45,000 in cash as well as a motorcycle by way of dowry. However, when her parents expressed their inability to meet the demands, Laita was allegedly tortured and made to set herself on fire by her in-laws on April 30. She was referred to Safdarjung Hospital, Delhi, where she succumbed to her injuries on May 1. In another incident, the police has booked Kavita Soni’s husband Joginder, father-in-law Bhagwan Das, mother-in-law Sumitra Devi and sister-in-law Meenu, all residents of Palhawas village, 22 km from here, on charges of brutal harassment for dowry, intentional humiliation, criminal breach of trust and criminal intimidation. A case has been registered against them on a local court’s directive. The ambiance of the Brahmsarovar was not only colourful but also musical as the kar sewaks performed the kar sewa along with singing bhajans. Gaudiya Matha devotees along with their samkirtan mandali and mrindagama and cymbals thrilled the pilgrims visiting Brahmsarovar. Nearly 500 kar sewaks joined the cleanliness drive.The northern bank of the Brahmsarovar was cleaned by the kar sewaks. Presently, the water is being drained out from the ghats so that the ghats can be cleaned properly. Chief executive officer, KDB, Sanjeev Verma while addressing the gathering, said tirthas should be cleaned in such a manner that it should inspire the people to preserve the age-old tirtha.